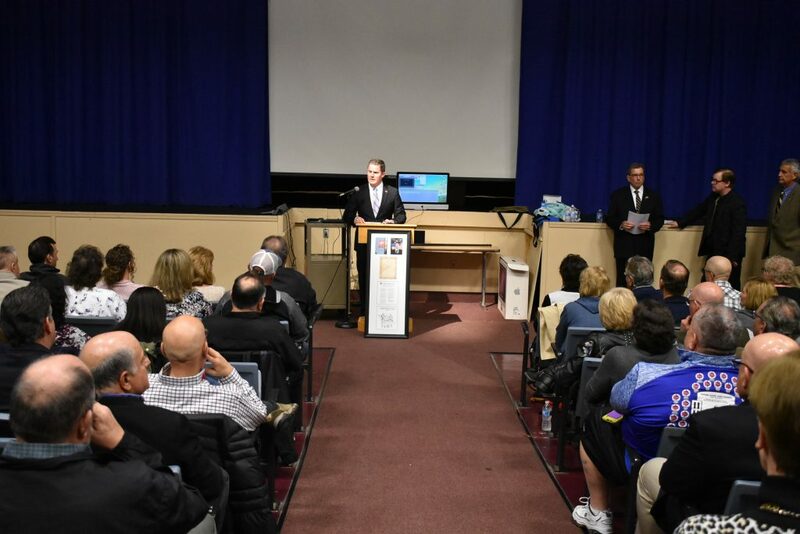 Father Judge High School hosted screenings of Remembering the 27 Crusaders, a documentary about the school’s graduates who were killed in the Vietnam War. Father Judge principal Peter Chapla welcomed the viewers to the first screening of Remembering the 27 Crusaders on Nov. 9. The auditorium at Father Judge High School was silent except for the steady sounds of sniffling and crying once the credits for Remembering the 27 Crusaders played. Then, when the lights turned on, the families of the 27 soldiers who were killed in the line of duty in Vietnam burst into enthusiastic, if somber, applause. The documentary about the 27 Father Judge students who were killed and how their deaths impacted their families held its first public screening Friday, Nov. 9. About 200 people attended the premiere. Other screenings were held throughout the weekend. “I want to offer a special thank you for the gold star families that are with us tonight, and thank them for their bravery and their willingness to come forth to tell their story. That, I can assure you, is painful,” said James Kirlin, before the screening. A Judge graduate and Vietnam veteran himself, Kirlin came forward to filmmakers John Ricciutti and Shawn Swords with the idea before production began. “To every Vietnam veteran that’s here tonight, welcome home, brothers,” Kirlin said. Since production began in the spring, Ricciutti, Swords and the film’s crew endeavored to interview the surviving families about their whole stories, not just the killed family member. About 700 people, including family, friends and neighbors of the 27 Father Judge graduates, attended the weekend’s screenings. The documentary begins by painting the landscape of Northeast Philadelphia in the 1950s and ‘60s. Laughter rumbled through the audience as interviewees recalled neighborhood hotspots like pools, parks and dances. One person said the ‘50s and ‘60s felt like two different centuries due to the Vietnam War. The film then transitions to tell the stories of some of the family members who heard the knock on the door, which usually designated the dreaded visit when soldiers would go to the family’s homes and relay the bad news. Patricia Rooney recounted hearing the knock on the door and her father telling her not to answer it. “I open the door and my father put his head down on the table. He knows instantly what had happened. I didn’t know. I was 9 years old,” Rooney recounted in the film. They received the news her brother, Stephen Miller, was killed at 21 years old. Swords previously told the Times that a large focus of the documentary was to provide these families with a stage to tell their stories. At the time period, many families stifled the emotions and did not talk about it in a healthy way. Marianne Ahern and her family discovered her older brother Raymond was killed shortly before Thanksgiving, and her family never celebrated the holiday again. Skipping holidays was a recurring theme among those interviewed. Dennis Kilderry was the youngest family member interviewed. His uncle, Michael Kilderry, had been killed in the line of duty, and he saw firsthand how the trauma could impact the family for generations. Kilderry said he was interviewed because he had lost his father, aunts, uncles and grandmother who had known his uncle. “It was really emotional reflecting on them not being here and me being able to tell the story,” he said. The screening united Kilderry with a couple of his uncle’s war buddies. One of his uncle’s buddies, who never met Dennis, drove over seven hours to be with him at the screening. “That shows you how tight the Marines are,” he said. Swords said filming some interviews felt almost intrusive to families, but realized that in many cases, this interview was the first time they talked about it. 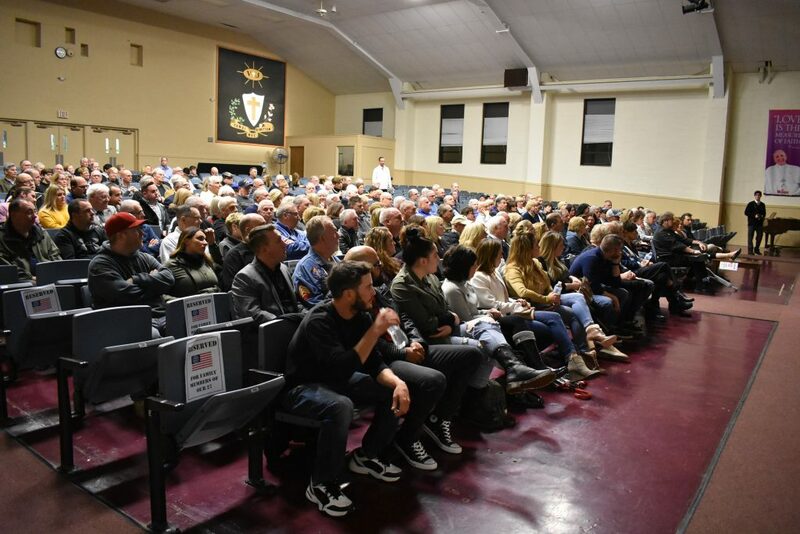 Due to time constrictions, only about 12 families were featured in the documentary, but Swords said there are plans to release biographies and family interviews for all 27 soldiers, with a tentative release in the spring.